Junior Mark Johnson caught nine passes for 155 yards in the Pioneers’ 56–22 non-conference victory over visiting Lakeland Saturday night. 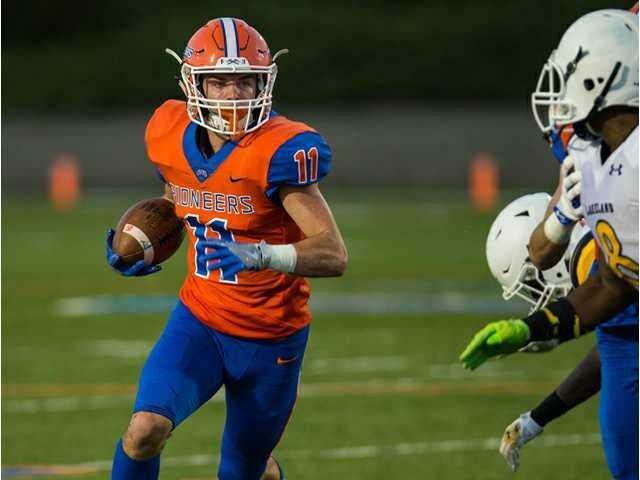 POSTED September 28, 2017 11:34 a.m.
Thirteenth-ranked UW–Platteville raced out to a 28–0 lead and rolled past visiting Lakeland 56–22 Saturday night in Ralph E. Davis Pioneer Stadium. The Pioneers, who came from behind in their first two victories, needed no comeback Saturday. They gained 241 yards and scored touchdowns on their first four drives. Sean Studer ran in for a two-yard score in the first quarter, then Tyler Blang connected with Mark Johnson for second-period touchdown passes of 14 and 30 yards, the latter with Johnson extended full out in the end zone to haul in the bomb. Wyatt Thompson finished the early onslaught with a nine-yard TD to give the Pioneers a 28–0 lead just five minutes into the second quarter. The Muskies, the two-time defending Northern Athletic Collegiate Conference champions, struck back on a safety and a pair of Michael Whitley second-quarter touchdown passes. Blang and Johnson helped the Pioneers regain momentum right before half on a 42-yard scoring hookup, giving UW–Platteville a 35–14 lead at halftime. Blang (25 yards to Tim Jansen) and Whitley exchanged third-quarter touchdown passes. Studer scored another short TD in the fourth quarter, and Colin Schuetz closed the scoring with a two-yard run. The Pioneers gained 516 total yards, including 286 on the ground. Studer ran for 118 yards and Thompson added 87. Blang completed 14 of 22 for 230 yards and the four scores in his first start. Three of the TD passes went to Johnson, who finished with nine receptions and 155 yards. Whitley threw for 305 yards and ran for 45 for the Muskies, who finished with 354 yards while dropping to 1–2 on the year. UW–Platteville (3–0) opens Wisconsin Intercollegiate Athletic Conference play against 24th-ranked UW–Stout next Saturday at 2 p.m. in Ralph E. Davis Pioneer Stadium. The Blue Devils’ 2–0 record includes a 25–22 win over St. Thomas, then ranked fourth in the D3football.com poll, on Sept. 9. The Blue Devils’ game against short-handed Trinity Bible was cancelled Saturday, meaning Stout will come in undefeated and nationally ranked. First downs — L 24, UWP 24. Rushing — L 19-49, UWP 55-286. Passing (comp-att-int, yds) — L 28-47-0, 305, UWP 14-22-1, 230. Fumbles–lost — L 1–0, UWP 0–0. Penalties-yards — L 7-60, UWP 12-104. Rushing — L: Michael Whitley 15-45. UWP: Blang 14-22-1, 230. Passing — L: Whitley 28-47-0, 305. UWP: Sean Studer 22-118, Wyatt Thompson 13-87. Receiving — L: Dezmen Morse 9-98. UWP: Mark Johnson 9-155. Tackles — L: Diante Moses 11. UWP: Luke Johnson 8, Josh Hotchkiss 5.